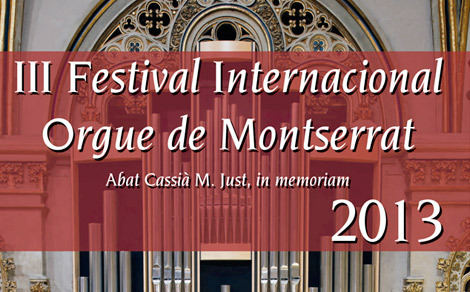 3rd International Festival Montserrat’s Organ Abat Cassià M. Just, in memoriam. Great artists, choral and chamber music ensembles gather around Montserrat’s organ in order to offer the great classical and contemporary repertoire. Financed by Montserrat’s Abbey and "Obra Social Caixa Penedès”, the international festival has been directed by F. Jordi-Agustí Piqué, under the guidance by organist Miquel González. F. Manel Gasch, Montserrat’s abbey administrator, coordinates the whole project. Catalunya Música collaborates with this festival, and is going to record some of the concerts. They will all be broadcasted over Montserrat’s website and Montserrat Comunicació (www.montserratcomunicacio.cat / Montserrat Ràdio 100,6 FM). The festival’s opening will be on Saturday 29th June, with El Pessebre, by Master Pau Casals. It is going to be the first release of this work’s version for organ, soloists and choir. Choirs from FCEC (Catalan Federation of Choir Associations) and soloists Elena Copons, Gemma Coma-Alabert, David Hernández, Xavier Mendoza and Pau Bordas, under the conduction by Daniel Mestre, and the organ accompaniment by Mercè Sanchís, will offer this oratorio, in choir and organ adaptation as suggested by Pau Casals’ widow, to present to the public the work of this brilliant Catalan musician. On Saturday 20th July, Professor Ullrich Böhme is offering a concert including some of the great masterpieces by Johann Sebastian Bach. The German organist is Bach’s successor at St Thomas Church in Leipzig, the town where Bach wrote his great choral and organ works. Maestro Böhme is renowned as one of the greatest organists in Central Europe. On Friday 2nd August, as part of Montserrat’s 43rd Meeting of Liturgy Singing Entertainers, Montserrat’s new harpsichord will be presented on a concert. This instrument has been handcrafted by Ignacio Bidart, and will allow us to listen –together with a positive pipe organ- the concerts for two keyboards by Father Antoni Soler –former Montserrat chorister- and works by G. F. Händel and Krebs. This will be performed by Maestro Miquel González and Father Jordi-Agustí Piqué. On Saturday 17th August, Montserrat’s organ will meet organist Josep Vicent Giner and Andorra’s Classical National Orchestra (ONCA), under the conduction by Gerard Claret. This will be a singular concert, since we will be able to listen to the famous concerts for Organ and Orchestra by Georg F. Händel. On Friday 30th August, as part of the Course for Church Organists, homage will be paid to the Catalan organist Montserrat Torrent. She is going to perform the main works of her repertoire, which have granted her international career, and made her become one of the most renowned pipe organ teachers in the world. The 3rd International Festival Montserrat’s Organ pays homage to the memory of Father Abbot Cassià M. Just, organist and outstanding musician, a man of God and culture, who passed away on March 12th, 2008. At the same time, this musical meeting gives us the possibility to listen to some of the best organists worldwide play the Blancafort organ (2010). All concerts will take place in Santa Maria’s Basilica in Montserrat at 9pm. Entrance is free of charge.